Located in the scenic fishing village of Murrells Inlet, South Carolina, just 15 minutes south of Myrtle Beach International Airport. 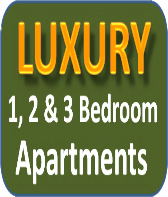 Luxury fully equipped apartments for rent by owner - renting directly from the owner will always get you the best deal! Good old Southern hospitality and cooking await you along with golden sand beaches, plentiful restaurants and night life plus shopping that rivals the best in choice but not price! Myrtle Beach - A golfers paradise made up of sun drenched fairways and challenging greens. With 100+ beautifully landscaped courses that rank amongst the best in the world, Myrtle Beach has become synonymous with sun, golf and sand. Wachesaw Plantation East Golf Club is a championship eighteen-hole facility built on the site of a former rice plantation and is rated in the top 100 best courses in America.